Let’s start with the obvious – The First Lady looked amazing, as always. She was elegantly dressed (in Tracy Reese) without being dowdy. She’s in fantastic shape, with toned arms portraying an image of health and wellness (which this country could use more of), and she’s got prominent features that the camera loves. 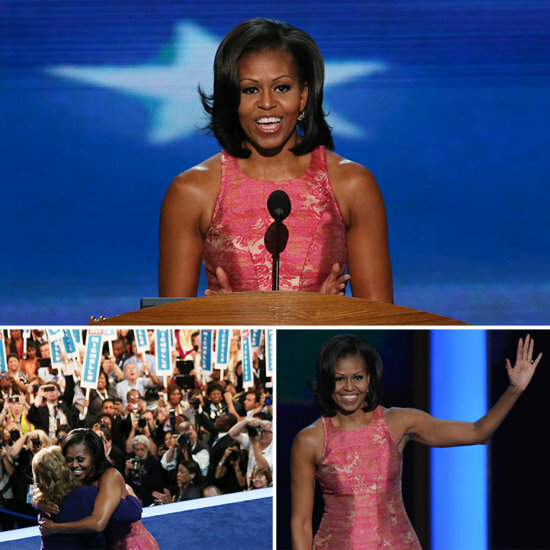 But beyond just an image, Mrs. Obama delivered a charming and likeable personality to match. When I listened to Ann Romney speak at the RNC, I liked her – until she tried to relate her “struggles” during college (um, who doesn’t struggle and eat tuna and pasta in college?!) to America’s middle class. I wasn’t buying it. Her and Mitt used an ironing board as their dining room table. In college, I didn’t have a “dining room” table. I found it all a bit of a desperate stretch that was, quite frankly, insulting. In contrast, Michelle Obama talked about the burden of school loans – not just for her and her brother, but for her parents. Now that’s something I can relate to. My family had to do the same thing – I took out loans and so did my folks, and we both spent years paying them off. I remember selling CDs and clothes just so I could buy text books. And Mrs. Obama delivered her tales without being condescending. It’s not an easy balance in politics. She made it believable that Obama built his own American Dream through more hard work than privilege. I also found her approach to balancing her husband’s “promotion” with her daughter’s needs refreshing and honest. Again, not an easy accomplishment – it would be quite easy to seem faux about any hesitancy of your husband’s endeavor to become the leader of the free world. But she sold it. I believed that she had concerns regarding how it would affect her daughters – and so far, it seems, the Obama’s have done a good job keeping their children grounded during this time of their lives. I appreciated that the First Lady wasn’t all about repeating one singular mantra such as “women, women, women,” but rather balanced her belief in family, her marriage, hard work and strong relationships built on love, not power. She resonated with me as a woman, a Mom, a (former) wife, and even an entrepreneur (work hard and you can get what you want in this country). She did a fantastic job just coming off... real. And in a world full of phonies, I for one appreciated that. No, I don’t think this fantastic speech means she should run for office (really, CNN? ), but I do believe she hit a Grand Slam in connecting with the American audience and warming up the stage for her husband. Some of my Tweets from last night further convey some of her best soundbites, below. What did you think of our First Lady? Like @barackobama, keep “getting up and going with courage and grace.” Well said & good #inspiration from @michelleobama. This entry was posted in Business, strong women and tagged Ann Romney, barack obama, BarackObama, CNN, current-events, Democratic Convention, DNC, DNC2012, First Lady, michelle obama, MichelleObama, obama, politics on September 5, 2012 by Christine. I very much appreciated the positive and uplifting themes of the First Lady’s speech. I personally think the Romney’s seem to have been told to try and connect with the middle class and they went about it in a way that felt it was pandering. They should be embracing their life as the American dream and discussing how they believe everyone should have the ability to raise five, healthy sons and send them to college and see them be successful. And that they want everyone to have the chance to seek out alternative medical treatments for illness. Because those are the experiences that the Romneys have had that we all hope every American could realistically aspire to. Unfortunately the Romney’s were kept from holding out this more real and true version of their life because they represent a platform that seeks to keep those choices and advantages only in the hands of those who have them now. The 1%.